The Burquitlam Capital makes comfortable living with modern conveniences beautifully affordable. Whether you’re quickly heading out to Coquitlam or Vancouver on the SkyTrain or having a quiet night in, the condos at The Burquitlam Capital have everything you need—at an incredible price—to make yourself at home. Featuring 189 condominiums, four townhomes and 10,534 square-feet of commercial space, The Burquitlam Capital is designed to fit your needs and more. And with new-home warranties and fob-restricted access, your place is protected from the ground up. Whatever the occasion, the building’s second-level podium rooftop terrace offers a shared barbecue space, kids’ play area and community garden for family, friends and, most importantly, residents to enjoy. You don’t need to go to Vancouver or Coquitlam to find the perfect venue for your party—even though they’re close. The lounge and meeting area is just the place to book your private event and bring your friends, and your plans, together. At The Burquitlam Capital, staying in shape is as simple as staying at home. The fob-restricted gym provides homeowners with a dedicated workout space featuring cardio machines, free weights and workout machines. 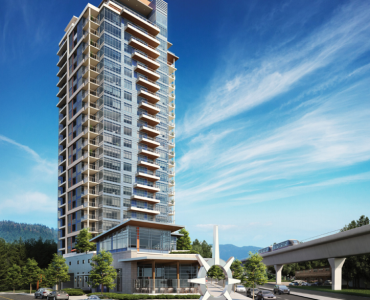 Sustainability is an integral part of living at The Burquitlam Capital. Just 200 metres away from Burquitlam SkyTrain Station, The Burquitlam Capital is carefully crafted for a walkable experience for residents. All appliances are ENERGY STAR certified to reduce energy consumption, and every suite features a Central Recirculation Ventilator (CRV) that efficiently fills each room with fresh air. And with extra insulation in walls, electric vehicle charging stations, and motion-activated lights in common areas and the parkade, the building meets the latest ASHRAE sustainability standards.